This self-drive studio tour features the works of over 50 artists in a large variety of mediums where you are sure to find something for everyone! Maps are available online or at locations around the island. I will be at Studio # 3 The Masonic Lodge across the street from the High School. Additional events to be posted as they are confirmed. I am currently taking orders for commissioned garden art and jewelry. Have a piece of china or pottery you would like to incorporate into something special? If so contact me at Mosaics@Artcycled.com. Starting July 20th you can find a nice vareity of my jewelry at MaJe Gallery in Edmonds, WA. 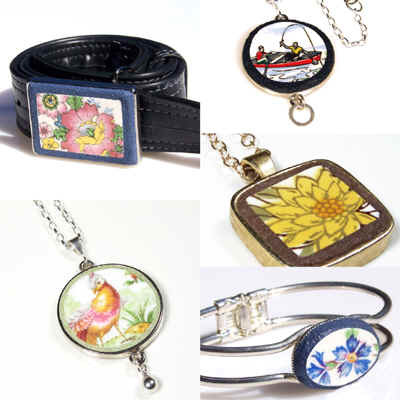 Artcycled Mosaics offers handmade, one of a kind upcycled mosaic jewelry, garden art and home accessories. My garden art ranges from bird baths, mosic fish, tables and outdoor friendly mirrors. My unique broken china jewelry includes pendants, necklaces, earrings, rings, bracelets and belt buckles all hand cut from upcycled and recycled china plates. I love to transform cracked or broken plates, china dishes and serving pieces into unique and new works, giving those old treasured items a new lease on life with my broken china mosaics. My unique handcrafted mosaic garden art is designed to enliven any garden setting. Distinctive birdbaths, birdhouses, tables, jewelry, gifts and garden art are created, in the picassiette style, with recycled tesserae (tile, pottery, broken china, glass and found objects) when ever possible. November 24, 2013 "Sustainable Gifts That Keep On Giving" Seattle Times http://seattletimes.com:80/html/pacificnw/2022201893_greenmarketxml.html. I was thrilled to be featured in a short list of environmentally friendly gift giving ideas for the holidays in the Pacific Magazine of the November 24, 2013 Seattle Times. "For the gardener: Seattles Darcy Thompson has created Artcycled Mosaics, a collection of upcycled jewelry, garden art and home accessories. 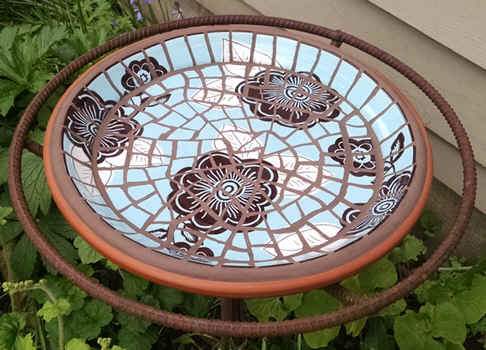 The pieces are made out of recycled materials such as broken china mosaics, repurposed into new works such as bird baths, small tables and outdoor-friendly mirrors that add a pop of color to any garden. Thompson brings her work to art shows around the Seattle area. Check her website for her nearest show or order online." My handcrafted garden art and jewelry pieces make great gifts for weddings, anniversaries, birthdays, housewarmings or any occasion for the garden enthusiast! I hope you enjoy your visit, if you see something you are interested in please contact me for price and availability. Custom orders are welcomed and can be designed to suit a particular theme, color combination or special occasion. Turn around time depends upon the season and my current schedule. For the 2011 Northwest Flower and Garden Show I had a blast working with Susan Browne Landscape Design to provide some fun and colorful elements to her Gold Medal "Run Little Pigs Run" display garden. I created some truely unique flowers for the entry to the wolf den as well as an assortment of teal, orange and black flowers in front of the straw house. This project features a large "Tree of Life" medallion in front of a historic park building. In addition a mosaic butterfly, woodpecker and turtle were installed in the new "tot lot" sandbox area. Judkins Park Apartments Courtyard Art Project in Seattle, WA. Click here to see photos of this fun project that turned a bland courtyard into an inviting, colorful and playful area. I generally work in a traditional mortar and grout process because I feel that this process holds up the best for exterior pieces. I also do my own welding and copper work and design many of the stands used to display my work. Artcycled is a name I came up with, and is now widely used, to express my desire to utilize recycled, repurposed or reused materials when ever possible. It also reflects the fractured nature of Picassiette pottery or broken china mosaic which is the primary style of my mosaic garden art. Recycling or upcycling items into new uses is a great eco friendly alternative!